Jarish-Herxheimer Effects Associated with Immune Detoxification Overload: Jarish-Herxheimer Effects typically have predictable distributions and patterns of occurrence within test subject populations.23,24 In the case of ACS 200, a portion of patient populations receiving the product may experience the associated immune detoxification events listed below. In order of known frequency, these may include from the most frequent to the most rare ? mild to moderate headaches, arthalgia, hyperdiaphoresis, nausea, afebrile flu-like symptoms, simple malaise, erythemia, skeletal and dental pain, itching, rigors or chills, diarrhea typically of short duration, vomiting of short duration, fever. 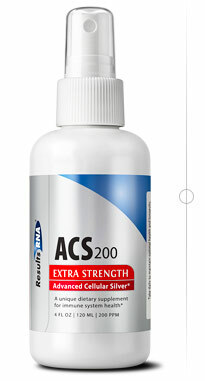 Associated immune detoxification events that arise when using ACS 200 can be managed by ceasing all silver ingestion for a minimum 24 ? 96 hour wash-out period from the dosage schedule. With careful medical supervision, it is then generally possible to return to a dosage equaling just ? to ? of the daily dose level taken at the time associated immune detoxification events arose. Classically, such associated immune detoxification events suggest that the targeted immune burdens are resolving rapidly. Therefore, carefully continue a reduced dosage schedule for at least 3 ? 7 days. The ? to ? dosage level is determined by the patient's "pre-reaction" dosage. Under medical supervision, the reduced schedule is then slowly increased until the optimal dosage schedule is achieved.25 The half-life of ACS 200 is 15 days.